Grodd attacks as Barry recovers from his fight with Zoom. 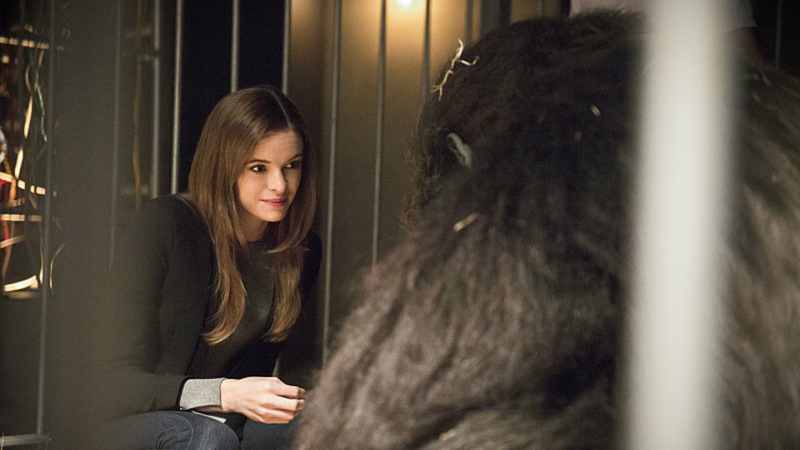 After the three jam-packed episodes, “Gorilla Warfare” feels like a much-needed breather, and Barry licks his wounds after a confrontation with Zoom and fan favorite villain Gorilla Grodd returns. While it didn’t pump the brakes on the worldbuilding entirely, “Gorilla Warfare” feels like it strikes a better balance than previous episodes have. With Barry recovering from a broken back courtesy of Zoom, “Harry” decided to high-tail it back to Earth-2 to deal with Zoom himself. However, his farewell is interrupted when Grodd comes back on the scene, kidnapping scientists in an attempt to create more intelligent Gorillas like himself. “Gorilla Warfare” has a tight focus on Barry and the emotional toll Zoom’s public defeat of him is having, and while the show allows him to get back on his feet quickly, it feels earned, as he spends most of the episode in STAR Labs working while the rest of Team Flash tracks Grodd. Much like The Legend of Korra, The Flash is able to get a lot of mileage out of PTSD, and doesn’t shy away from showing the psychological toll of things. While “Gorilla Warfare” doesn’t go quite as keep as Korra did, Barry’s emotional journey still felt satisfying, and any appearance from John Wesley Shipp’s Henry Allen is a good one. Grodd himself was even more impressive this time around, with Season 2’s expanded budget allowing him to step out of the shadows into glorious, full-lit view. He continues to be one of the show’s most compelling villains (Being a psychic ape, how could he not be? ), and his plan to create not destruction, but companionship, provides a great look into Grodd’s mind and evolution as he gets smarter and smarter. Some of the material involving Harry impersonating Reverse-Flash felt a little tacked on, but considering where Grodd is at the end of episode, it’s probably not the last we’ll see of the mind-controlling ape. “Gorilla Warfare” slowed things down a bit as Barry recovered from his encounter with Zoom, and the show benefited greatly from it. The interesting and impressive Grodd was a great break from more one-dimensional villains of the week, and Barry’s journey to recovery provided a nice through-line through it all. And hey, we even got a few glimpses of Hawkgirl courtesy of Cisco. “Gorilla Warfare” did everything a Flash episode should, providing a satisfying story while moving the ongoing plot forward, and doing it all with its patented mix of humor and heart. Was it great seeing Grodd? How’s the design for Hawkgirl? Tweet me @MaxMielecki. And be sure to follow us @YouNerded.